Kennedy's Body Taken From Home The body of Massachusetts Democratic Sen. Edward Kennedy made its way Thursday from Hyannis to Boston. It will lie in repose at the JFK Library in Boston until a weekend funeral. 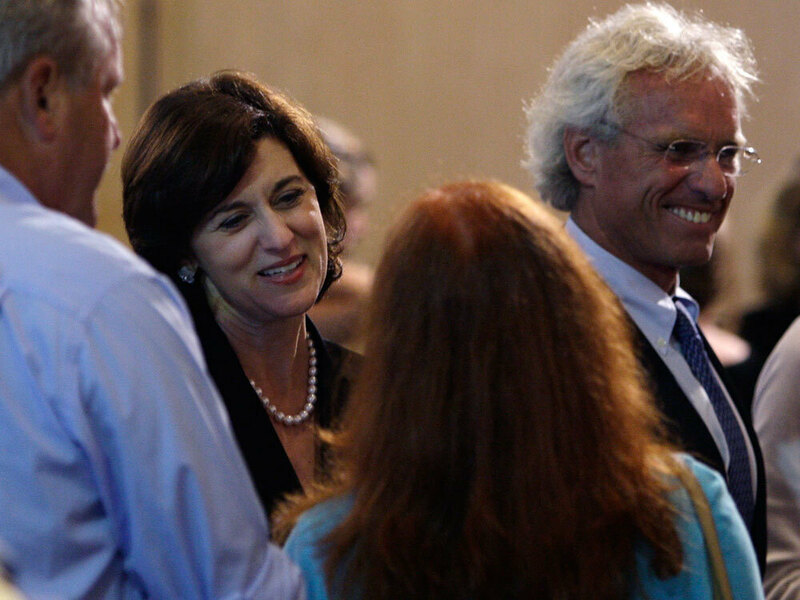 The body of Massachusetts Democratic Sen. Edward Kennedy made its way Thursday from Hyannis to Boston. It will lie in repose at the JFK Library in Boston until a weekend funeral. The senior senator from Massachusetts made his final journey to Boston today. After a private family mass, Edward Kennedy's flag-draped casket was driven in a cortege from the family home on Cape Cod. On the outskirts of Hyannis Port, a crowd stood silently as the processional passed. Daniel Winterbottom(ph) of Seattle was visiting Cape Cod with his family. Mr. DANIEL WINTERBOTTOM: In some sense, it's a passing of a generation of a legacy, I guess, and who'll take his place, I don't know. I hope Obama and the people (unintelligible) it's sad, sad, he meant a lot. SIEGEL: From Hyannis Port, the Kennedy motorcade traveled 70 miles to Boston. On the way, it passed through the town of Hingham. Local, Susan Haley, was one of the people waiting to show her appreciation of the late senator. Ms. SUSAN HALEY: He really was a senator for the ages. And I appreciate everything he's done. I think all his work has touched each American family in a positive fashion, whether they realize it or not. BLOCK: Once the motorcade arrived in Boston, it took a slow deliberately circuitous route through the city, passing the JFK Federal Building and historic Faneuil Hall. The procession ended at the John F. Kennedy Presidential Library in the Dorchester section of Boston, where the senator's body will lie in repose. NPR's Tovia Smith is at the library. She joins us now. And Tovia, tell us about the scene there, please. TOVIA SMITH: Well, there are a slew of people lined up here, Melissa. I can't even see the end of the line from where I am. Just minutes ago, the hearse pulled up into the circular driveway at the library to a kind of sober applause. It was followed by four limos carrying immediate family members, including, of course, the senator's widow, their five children, the senator's last surviving sibling now, Jean, as well as his sister-in-law Ethel Kennedy. Many of them waved from their cars and as they went by, the senator's casket was then escorted by a military honor guard, and the family will now have private time inside and then the public will be allowed. And you know, we've heard a lot about how Kennedy's family and, in fact, the senator himself has been planning all the details for a while now. I looked into the room earlier where the senator will lie in repose and saw crews arranging flowers around a casket. And I have to say, I was quite taken aback and then found out it was empty and it was just being used to figure out placement and lighting for later. And, boy, you know, it just does show you that they are minding the details here. BLOCK: And the senator should be lying in repose there through 3 p.m. tomorrow, I believe. Have you been speaking with some of the people who've been waiting there to greet the senator's motorcade? SMITH: It's an amazing sight. So many people signing a condolence book, so many with personal stories about how the senator helped them out. A woman from Nigeria who said that Kennedy helped get a daughter a visa. President - I'm sorry, parents of a slain soldier, who said Kennedy got them information about what happened to their son. And so many people here also have never met the senator, but felt - said that they felt profoundly touched by him. I spoke to an African-American woman with her three-year-old daughter, who says the little girl will have a better life because of Ted Kennedy. That woman, Tomasina Minor(ph) was literally in tears as she had her daughter write her name in the book as well. Ms. TOMASINA MINOR: She said, mommy, he died. I said, yes. Who was he? I said, he was a great man. His fight for all people - not just black people, but just all people. I love the Kennedys. SMITH: So, you can see a lot of emotion in that room and a lot more to come. The senator will lie in repose tonight and tomorrow. Then, private family memorial tomorrow night. A funeral mass at an inner city church on Saturday. And finally, the senator's final journey to Washington, where he will be buried on Saturday evening at Arlington National Cemetery. BLOCK: NPR's Tovia Smith at the JFK Library in Boston. Thank you, Tovia. Family members follow an honor guard as members carry the casket of Sen. Edward Kennedy to the John F. Kennedy Presidential Library, in Boston on Thursday. Noon Private Mass at Kennedy compound in Hyannis Port, Mass. 1-3 p.m. Motorcade with Sen. Kennedy's body travels from Cape Cod to Boston. 6-11 p.m. The public visits Kennedy's casket at the JFK Library and Museum in Boston. 8-3 p.m. Additional hours for public to pay respects at the JFK Library and Museum. 7-9 p.m. Memorial service at the JFK Library. The event is closed to the public. 10:30 a.m.-12:30 p.m. Funeral Mass at Our Lady of Perpetual Help Basilica in Boston, where President Obama is scheduled to speak. Kennedy's grave at Arlington National Cemetery open for public visitation. Sen. Edward Kennedy's flag-draped casket was placed inside a black hearse by a military guard at the Kennedy compound in Hyannis Port, Mass., on Thursday as his family young and old looked on, many wiping away tears. The motorcade carrying the late senator departed for Boston after the family had a private Mass at the seaside home. Kennedy, who died Tuesday at age 77 after a more than yearlong battle with brain cancer, will be buried Saturday afternoon at Arlington National Cemetery near his brothers, slain more than four decades ago. During a two-hour journey to his brother's presidential library in Boston, the motorcade passed sites that figured prominently in the senator's life. Among those accompanying Kennedy were nieces Caroline, daughter of former President John F. Kennedy, and Maria Shriver, daughter of his late sister Eunice; and his son Patrick Kennedy, a Rhode Island congressman. Crowds assembled along the 70-mile route that snaked from the family's compound in Hyannis Port, along the Rose Fitzgerald Kennedy Greenway, past the John F. Kennedy Federal Building and by the JFK stop on the city's subway system. Kennedy's wife, Victoria, put her hand over her heart as the procession rolled down Hanover Street in the North End neighborhood, past St. Stephen's Church, where his mother, Rose, was baptized and where Kennedy later eulogized her. The crowd applauded, and family members acknowledged them with a wave from their cars. As the motorcade passed historic Faneuil Hall, a bell rang 47 times for each year Kennedy served in the Senate. It then moved past the site of Kennedy's first office as an assistant district attorney. Finally it came to the John F. Kennedy Library and Museum, where his body will lie in repose. As many as 12,000 people waited in line to file past his closed casket and mark the end of a national political chapter that was equal parts triumph and tragedy. Kennedy's widow, Victoria, who greeted well-wishers filing past the casket, said the outpouring was deeply moving for the family. "I just want to thank them so much for coming this evening and showing love and support for my husband," she said. "It's a tremendous solace to all our family, and I just want to let them know how grateful we all are." Austin Howe, 15, a high school student from Laurel, Md., and his 46-year-old father, Scott Howe, joined about 20 others at the JFK Library before it opened Thursday morning. "He is someone who made a difference," Austin Howe said. "This is a person who served the people of Massachusetts and served the people of the United States." Kennedy's widow, Victoria Kennedy, and his nephew, Joseph Kennedy, thank visitors for their condolences. At the JFK Library, a military honor guard joined members of Kennedy's family, friends and current and former staff members to stand vigil around the clock as thousands are expected to file past the closed casket. An invitation-only memorial service will be held at the library Friday evening. On Saturday, President Obama will speak at a private funeral Mass at Our Lady of Perpetual Help Basilica, commonly known as the Mission Church, in Boston's Mission Hill neighborhood. It is the church where in 2003, Kennedy prayed for his daughter, Kara, who was successfully treated for lung cancer at a nearby hospital. A church official said former Presidents Jimmy Carter, Bill Clinton, George H. W. Bush and George W. Bush also are expected to attend the Mass. 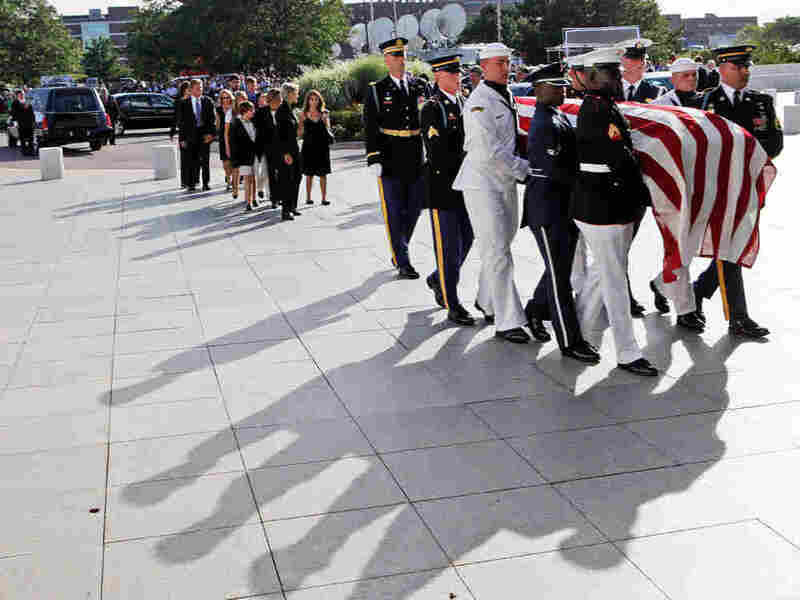 On Saturday evening, Kennedy will be buried near his slain brothers at Arlington. Other Kennedy family members buried on the famous hillside include former first lady Jacqueline Bouvier Kennedy Onassis and the former president's son, Patrick, who died two days after his birth.